San Diego, CA, November 12, 2007 -- UC San Diego electrical engineers have developed the world's most complex "phased array" -- or radio frequency integrated circuit. This DARPA-funded advance is expected to find its way into U.S. defense satellite communication and radar systems. In addition, the innovations in this chip design will likely spill over into commercial applications, such as automotive satellite systems for direct broadcast TV, and new methods for high speed wireless data transfer. The UCSD DARPA Smart Q-Band 4x4 Array Transmitter, the world's most complex silicon phased array chip. "This is the first 16 element phased array chip that can send at 30-50 GHz. The uniformity and low coupling between the elements, the low current consumption and the small size – it is just 3.2 by 2.6 square millimeters – are all unprecedented. As a whole system, there are many many firsts," said Gabriel Rebeiz, the electrical engineering professor from the UCSD Jacobs School of Engineering leading the project and an active academic participant in Calit2. The work was done by two graduate students, Kwang-Jin Koh and Jason May, both at the Electrical and Computer Engineering Department (ECE) at UCSD. Rebeiz presented the new chip at DARPA TEAM Meeting, August 28-29, 2007 in Chicago, Illinois. Additional details of the chip will be submitted to an academic journal later this year. This chip – the UCSD DARPA Smart Q-Band 4x4 Array Transmitter – is strictly a transmitter. "We are working on a chip that can do a transmit and receive function," said Rebeiz. 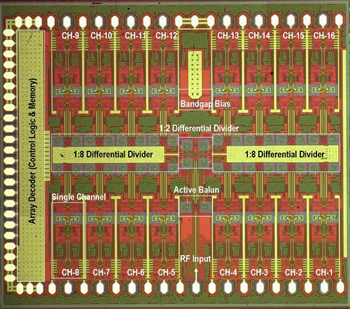 "This compact beamforming chip will enable a breakthrough in size, weight, performance and cost in next-generation phased arrays for millimeter-wave military sensor and communication systems," DARPA officials wrote in a statement. 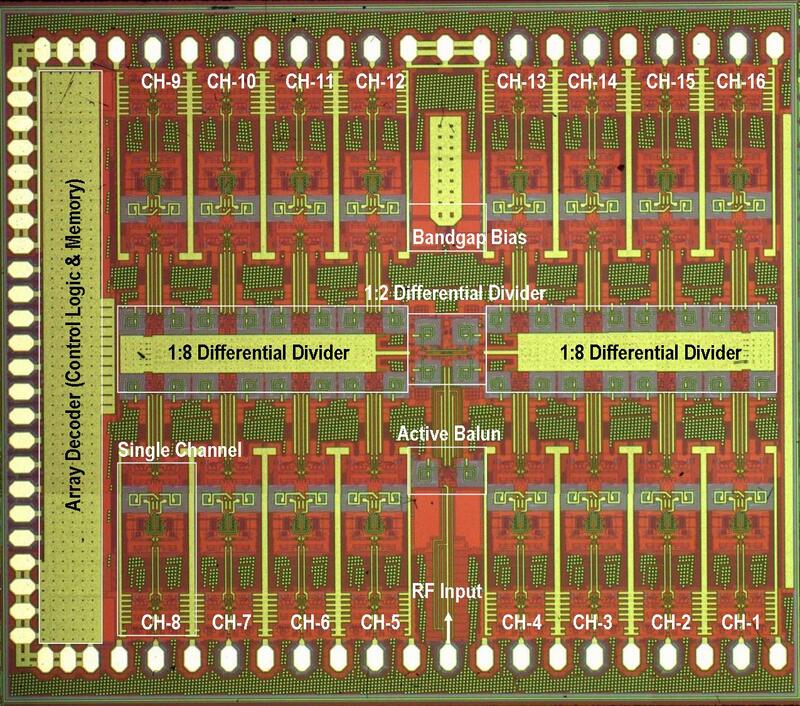 The chip also contains all the CMOS digital circuits necessary for complete digital control of the phased array, and was done using the commercial Jazz SBC18HX process. This is a first and greatly reduces the fabrication complexity of the phased array. The chip has been designed for use at the defense satellite communications frequency - the Q-band - which goes from 40 to 50 GHz. "If you take the same design and move it to the 24 or 60 GHz range, you can use it for commercial terrestrial communications," said Rebeiz who is also a lead on a separate project, funded by Intel and a UC-Discovery Grant, to create silicon CMOS phased array chips that could be embedded into laptops and serve as high speed data transfer tools. The Intel project is a collaboration between Rebeiz, Larry Larson and Ian Galton - all electrical engineering professors at the UCSD Jacobs School of Engineering. Larson also serves as the chair of the Department of Electrical and Computer Engineering. "If you wanted to download a large movie file, a base station could find you, zoom onto you, and direct a beam to your receiver chip. This could enable data transfer of hundreds of gigabytes of information very quickly, and without connecting a cable or adhering to the alignment requirements of wireless optical data transfer," explained Rebeiz who estimated that this kind of system could be available in as little as three years. Phased arrays have been around for more than half a century. They are groups of antennas in which the relative phases of the signals that feed them are varied so that the effective radiation pattern of the array is reinforced in a particular direction and suppressed in undesired directions. This property - combined with the fact that radio waves can pass through clouds and most other materials that stymie optical communication systems - has led engineers to use phased arrays for satellite communications, and for detecting incoming airplanes, ships and missiles.